Stop press! 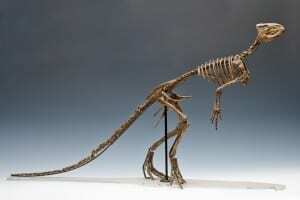 This week we are revisiting an old specimen of the week to bring you breaking dinosaur news. 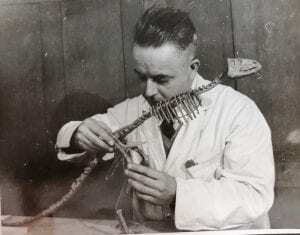 If you are a specimen of the week superfan you may remember Mark Carnall’s blog about the Grant Museum’s largest dinosaur. 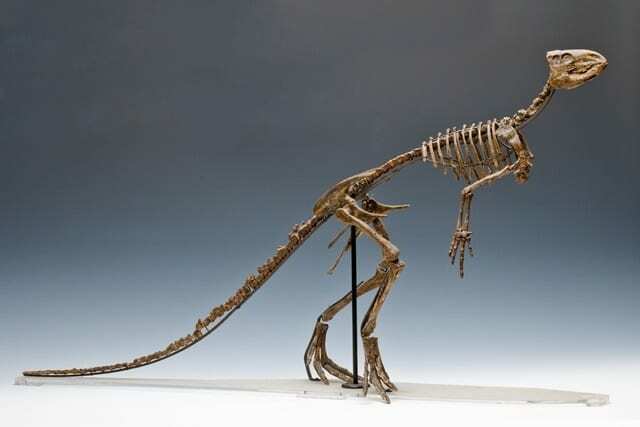 Check it out here to read more about one of the first dinosaurs to be described by scientists, and how our Hypsilophodon cast towers over the museum, a majestic 50 cm tall, but on a very high shelf. …Mark realised that our cast was not taken from either of the specimens on display at the Natural History Museum (NHM), and appealed for witnesses to identify the original fossil that our cast is based on. A mere 4 years later more Hypsilophodon information has come to light. As you can see from these images, our Hypsilophodon may not match the display specimens at the NHM, but it is a dead ringer for the cast below. Mark Graham, Senior Fossil Preparator at the NHM very kindly shared this picture with us, which shows one of his predecessors Louis Parsons mounting a Hypsilophodon skeleton in 1934. The shape of the skull and pelvis, the style of the metal mount and the ‘tripod’ pose of the skeleton are all perfect matches for our specimen. I am clearing out of my room to make way for the Geologists [? ], and came across this which I think – though I can’t spell it – is Hyphsolophendon foxi. L. E. Parsons mounted the original specimens many years ago, retaining this rather rough plaster cast.